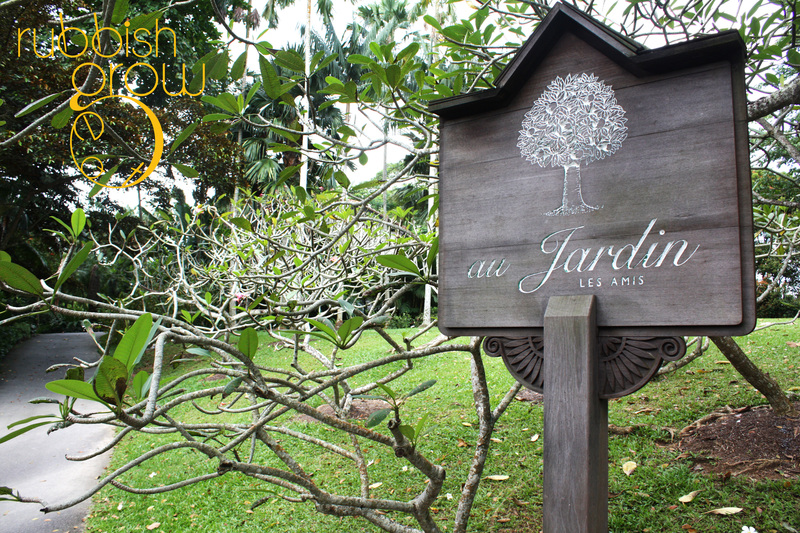 Ever since a mediacorp gay actor said that his date brought him here and impressed the pants out of him a few years ago–ok he didn’t say pants–Au Jardin (translation: “at garden”) has been on my wish list. Recently, instead of just serving on weeknights and weekends, Au Jardin opens up weekday afternoon lunches for only $45++. Directions: If you enter by the Visitor Center, Au Jardin, on a small hill, is just directly in front the Vistor Center but it is obscured by trees. So if you’re heading north, you’re on the right track, baby, you are born this way. Decor/ Ambience: The setup is a dream. 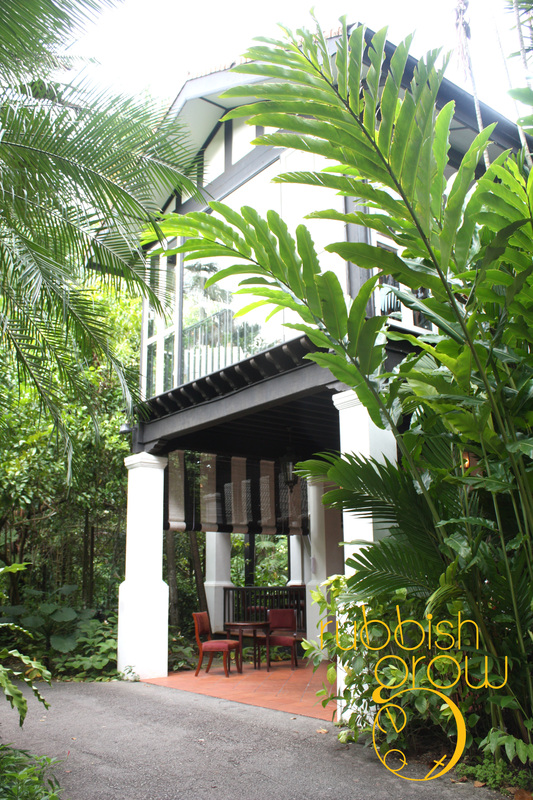 Nestled in lushness, the unassuming and secluded colonial bungalow stands quietly. The full-panaled windows allow natural sunlight to stream into the balcony of the second storey where the patrons dine. The surrounding verdure gives a sense of tranquillity and peace. Ella Fitzgerald and Louis Armstrong were singing softly. The temperature was set to a comfortable degree. 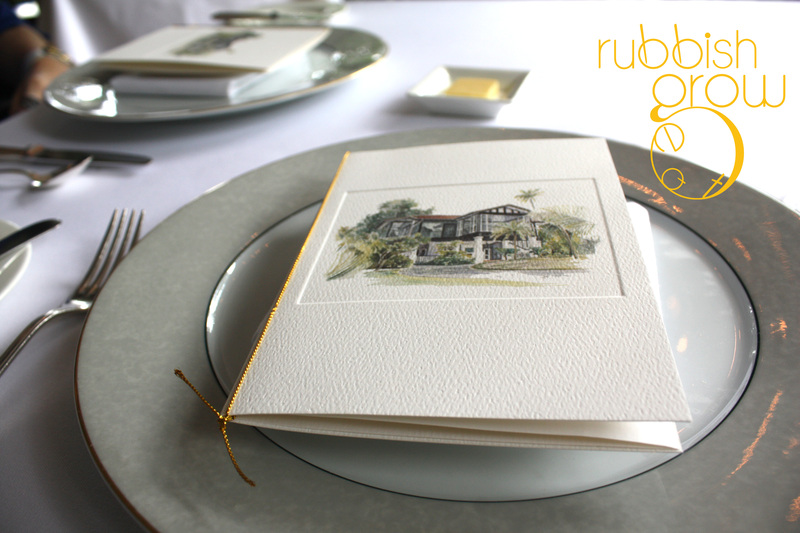 The menu came as a greeting card with a replica of watercolor painting of the colonial mansion. Side stools are available for bags. But the tables aren’t padded, and padded tables are essential for good restaurants. Another point: there were forest ants crawling all over the table–can’t be helped, I guess. But still, this place is pure class and sophistication. Even before the amuse bouche, we always believe that good gratis bread is one of signs of a good restaurant. It was crispy outside, soft and warm inside. Au Jardin started off with the right foot. 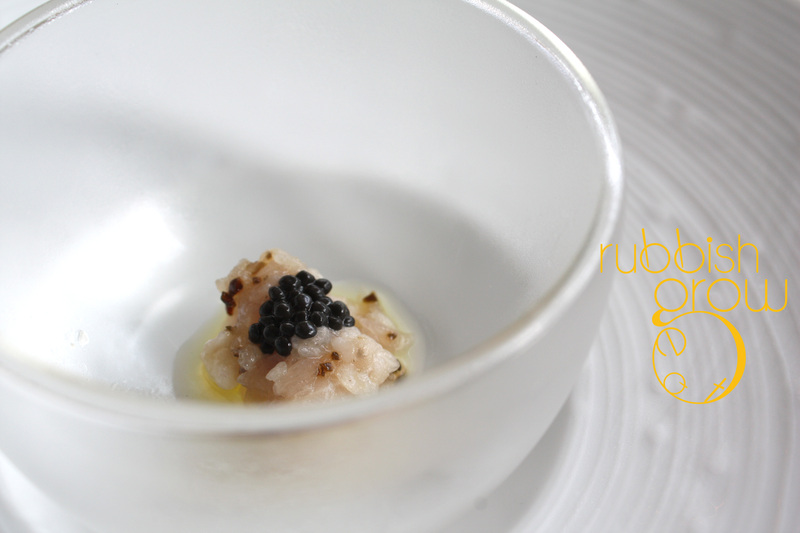 The amuse bouche was tuna tartare with caviar. The tuna was sliced into almost rice-like bits. 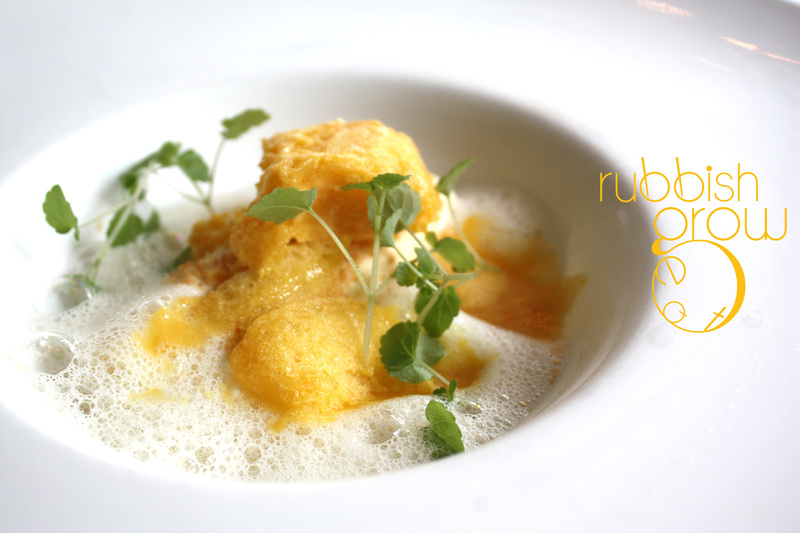 An elegant dish but nothing overly exciting. 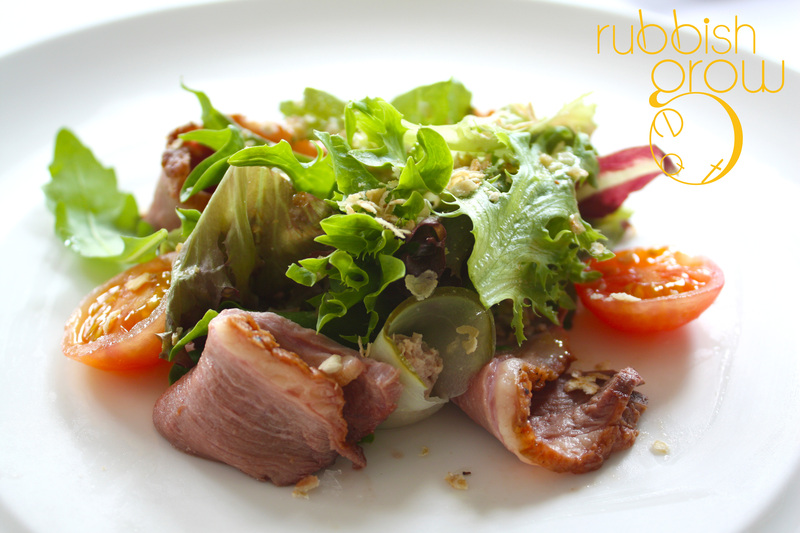 Chiobu had smoked duck breast salad, duck rillette mousse, gherkins, confit of tomato, oats and walnut dressing. She remarked that the smoked duck breast, usually tough, was particularly well-done, tender and not overly salty. The oats gave an extra, almost biscuity crunch. The balance of the salad–a mark of judging a salad–was spot-on, sweet, vinegary, salty and earthy. But to Wise Guy (me), there are bad salads and then there are salads. Salads are just salads. Very difficult to wow the eater. 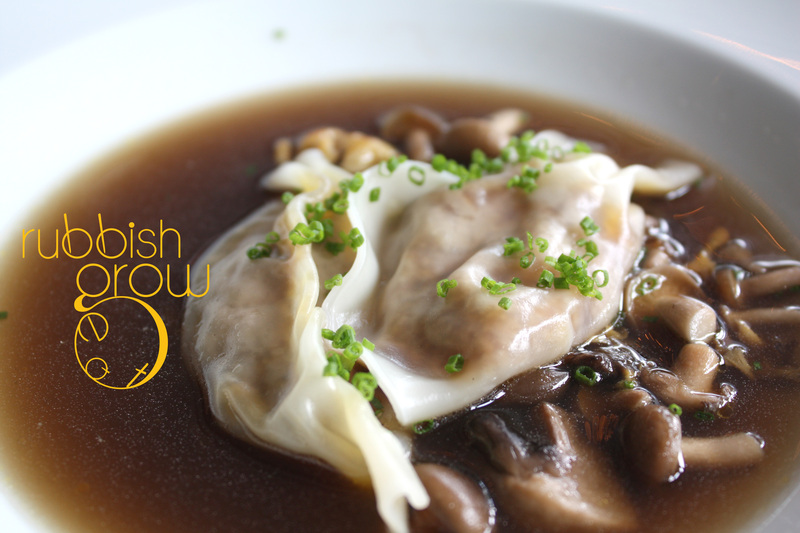 Wise Guy always picks the foie gras dish: fricassee of wild mushrooms, foie gras ravioli and mushroom broth. The mushroom broth itself tasted very Chinese, you know, Chinese mushroom soup. But wow, the ravioli–more like wanton–gave me a surprise. The translucent skin was as thin as gossamer. Bite into it and a sudden burst of foie gras oil and intense vinegar. I wasn’t prepared for the vinegar at all. This was a very smart move by Chef Ng Wei Han who has worked for the Les Amis group for about 6 years. I suspect the foie gras wasn’t top quality–remember the lunch isn’t expensive–and so you can taste the iron-ness of it and to cover the iron-ness, Chef Ng used a strong condiment. When the vinegar and foie gras oil dripped into the mushroom soup, the favors interacted, changed and gave the soup a punchline. An intelligent and startling dish. Quite appetizing too. 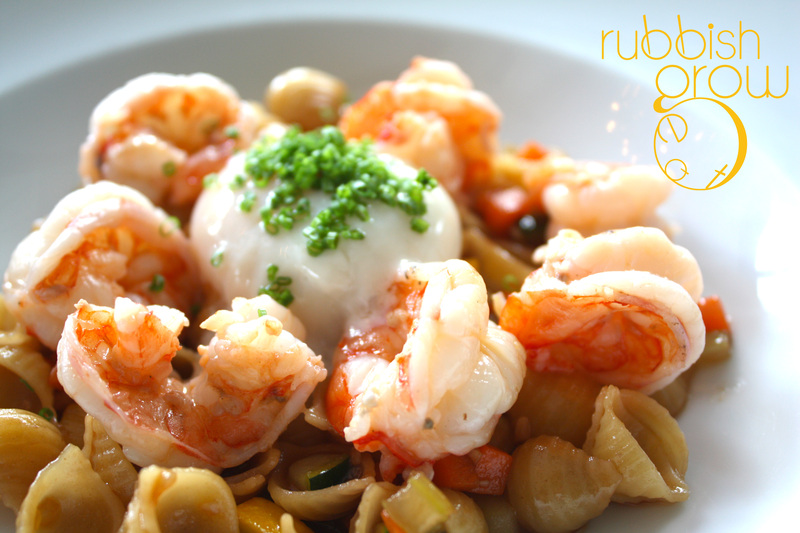 Prawn a’la plancha with shell pasta, egg confit, seasonable vegetables with shellfish glaze. Note the trend here? I think Chiobu is secretly on a diet! She was picking the low-calorie count food. The plating was gorgeous but when I asked how it was, she replied, “Pasta lor.” There was an overpowering shellfish taste, almost like the SIngaporean hae bee hiam (spicy dried shrimp paste) without the spiciness mixed with some shellfish, making the dish one-dimensional. I, however, like in life choices, always make the right decisions: roasted striploin & braised beef cheek with roasted potato, sweet corn puree and red wine sauce. I hate potato in general but this potato was amazing, roasted in such a way that brought out the natural sweetness. 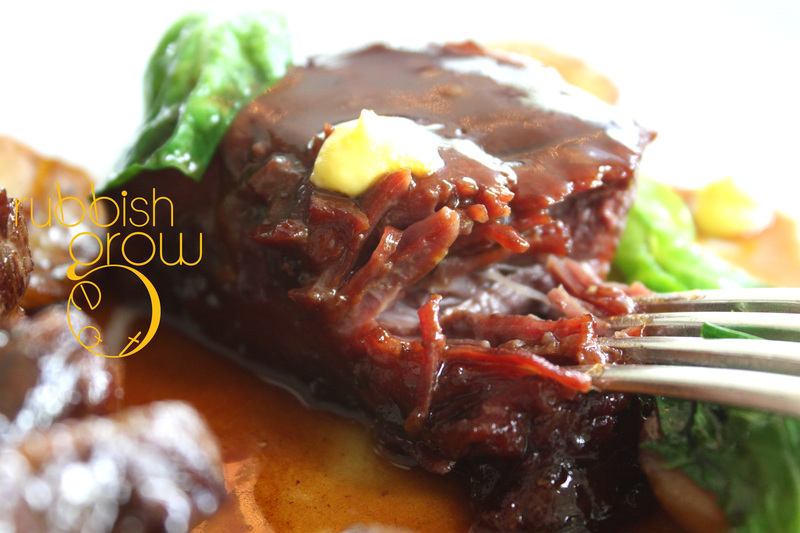 The braised beef cheek was so tender, and the red-wine sauce that stuck on it was so aromatic and sweet. The striploin was savory and complex, giving each bite a different taste, sometimes sweet, sometimes salty and sometimes peppery. However, a kvetch–which is the same complaint I have of the entree–is that the meat wasn’t of a better quality. That being said, the set menu only costs $45 and given the top-notch service and ambience and way of cooking, I really don’t think it’s fair for me to complain about the quality. 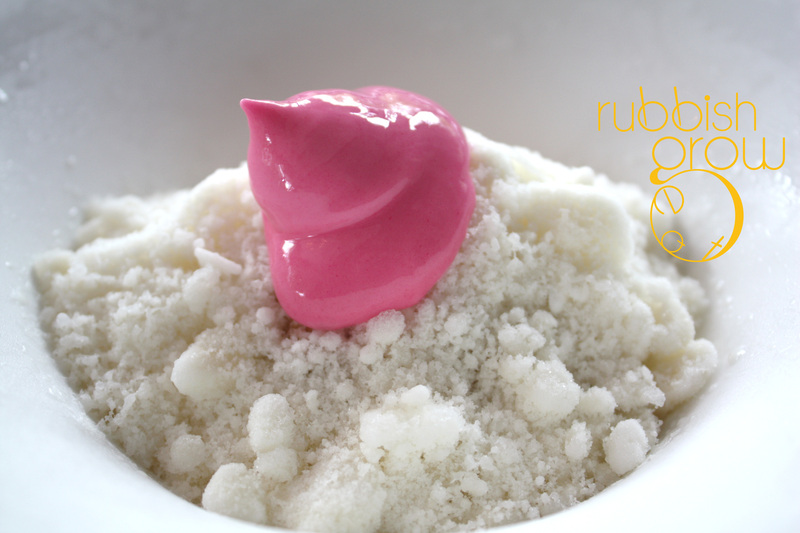 Chocolate Ice Kacang consists of gula melaka ice cream, milk shavings, valrhona dark chocolate mousse, rose petal (bundong) foam, corn and grass jelly. We tried two ways of eating: the first way was to NOT to mix the ingredients up, but dig some of each onto the spoon and eat it. I preferred this way because you can taste each ingredient separately and distinctly and yet they are in a way combining to give new flavors. The second way is to mix everything up, like ice kacang. I didn’t like this way so much because I didn’t know what I was eating and it just became a big mess. Chiobu didn’t like this dessert but I loved it for its innovation and playfulness. The taste could be more refined–I don’t think bundong goes with chocolate–but with some fine-tuning, this could be a hit. Or were we finished? 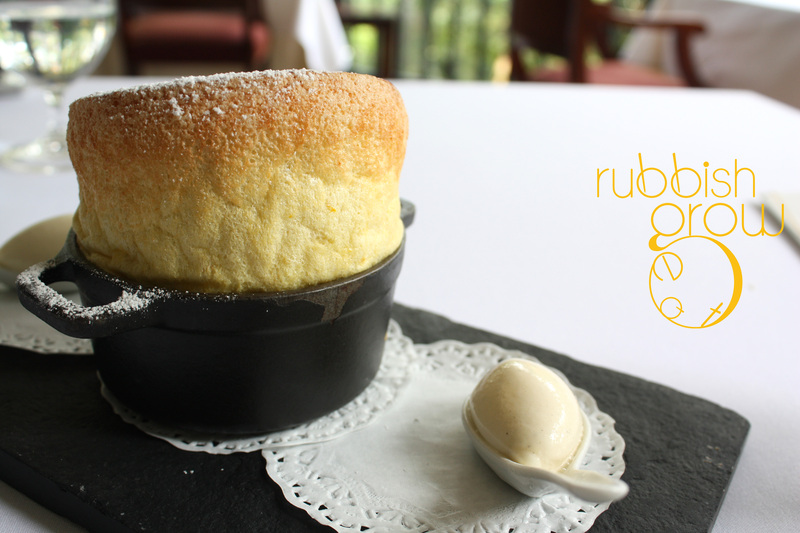 We witnessed someone who had a souffle ($22) and so we ordered it too. It came with two scoops of almond-vanilla ice cream. I liked everything I ordered so far, but this was a mistake. It looked amazing but the texture was more like a sponge cake, without the airiness of souffle, and the orange liquor was an overkill, making it extremely and unbearably bitter. Luckily, the end of the meal was sweet to us. The petit four were incredible! The madeleine was hot from the oven, so eggy and delicious, while the chocolate was so rich, going so well with tea. Service: There were more servers than customers! Water was promptly refilled; bread was offered continuously. Thoughtful, considerate, friendly without being sycophantic. They might have station a server permanently at the balcony because sometimes when we wanted something, we had to wait for a server to come out to the balcony. But still, one of the best service. Another thing we love about the place is that some time lapsed between courses, so that we knew the kitchen was actually carefully preparing our food. Lunches are meant to be 3 hours long anyway. We spent $132 for two in total. At the end of the meal, we were very satisfied with the service, ambience and the value of the meal. Except for the souffle, the food was reasonably well executed and intelligent. My suggestion is pick the right food. Communicate with the servers what you like and ask for recommendations. Be prepared to read another review of Au Jardin; I think I’ll celebrate my birthday here and try the Sunday Brunch. We’d like to thank the director, Philippe Pau, for his hospitality and humor. glad you like it! 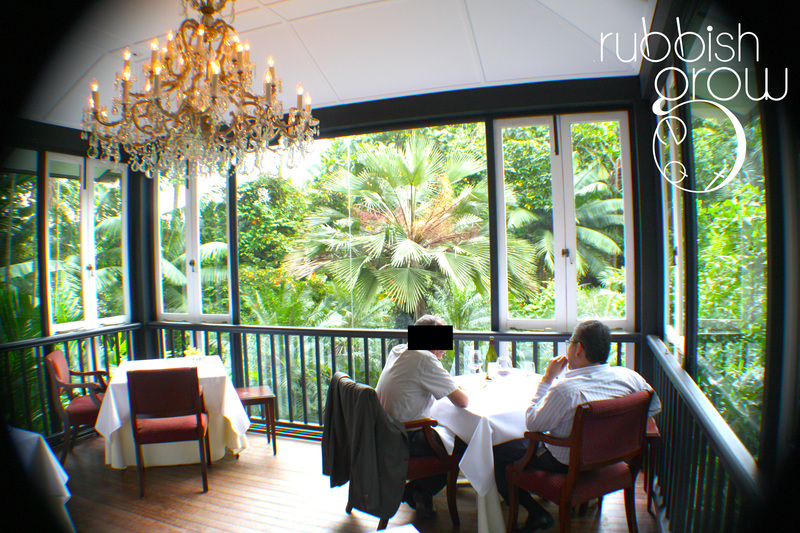 :) You made a good choice, Au Jardin is really a place for special occasions. 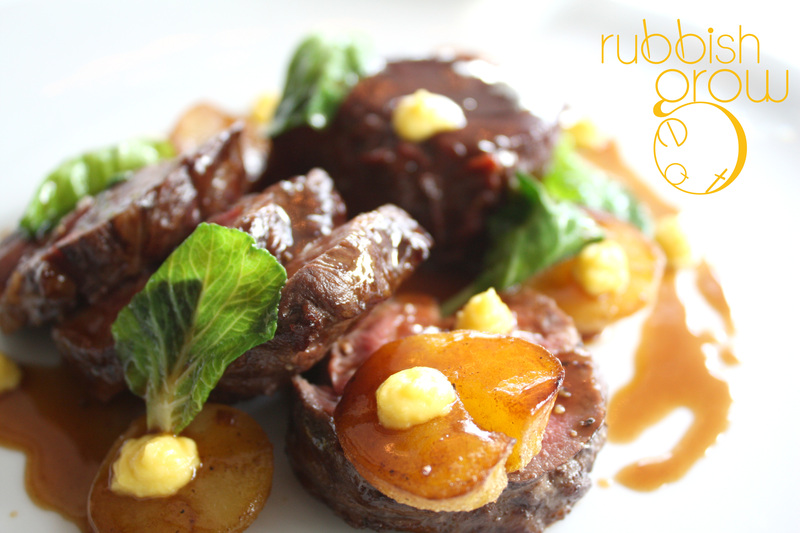 It’s in my list of V-day Restaurants, coming out next week. Yes. It was for lunch.